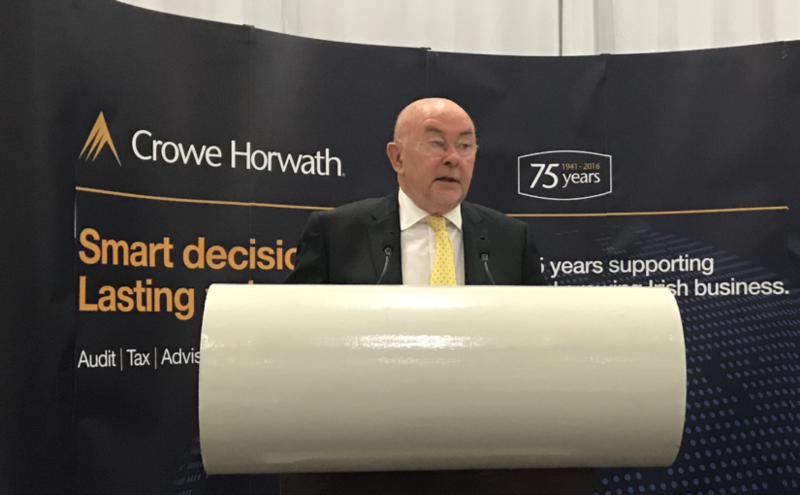 At Crowe’s Budget 2018 breakfast briefing earlier this morning former Minister of Finance and current Chairperson of the Institute of International and European Affairs, Ruairí Quinn, outlined the progress of the Brexit negotiations. Below is a short summary of the topics and issues covered. Ruairi Quinn believes the recent budget is further evidence that the Irish government and its civil servants are looking to the future and laying the foundations for strengthening ties with our EU member states post-Brexit. The increase in allocation to the department of foreign affairs of €23m will help reposition Ireland and enable us to strengthen existing relationships with the other 26 member states of the European Union in advance of Brexit being completed. Quinn outlined that before now the Irish government allowed the UK to take the lead on many of the more challenging EU issues which were of concern to our country. Britain carried more clout in the EU and they were able to shape policy better in a way that suited us without Ireland having to expend scarce political capital. The Department of Foreign Affairs and the Taoiseach are acutely aware of the fact that we are moving to the next stage of our relationship, separate from Britain, with the other 26 states and the increased budget allocation is evidence of their commitment. Ireland is now looking to form closer ties with a coalition of countries to ensure we are not isolated as our strongest ally now bows out of the EU. In seeking out stronger ties with likeminded allies, Quinn noted that Ireland is not the only English-speaking language country in the Union, Cyprus and Malta are bi-lingual. They are also former colonies of Great Britain and thus have a very similar legal and political system to ours. There are also other countries that we have strong similarities with as well as historic ties. Similar to Ireland the Dutch and the Danes have a long tradition of agricultural exports to the UK and would have the same concerns about their agri-business sector as we have. Ireland also has strong ties with other countries like Finland, Portugal and the Baltic States. All of these countries have the same voting rights as Germany and France, so the idea that France and Germany will now be in a position to dictate terms to the other EU states, it is simply not going to happen. The concept of there being a federal budget or harmonisation of tax has no substance as the votes are simply not there for it. Quinn also believes that given that the French have not had a balanced budget since 1974, they are simply not taken seriously when it comes to fiscal matters. When it comes to Brexit, Quinn noted that Ireland is far more prepared the Britain. In Ireland there have been a series of government seminars, civic forums and an engagement on a scale that he has not seen before. This activity has largely been driven by the permanent government (the civil service). Within the uncertainty of the current political arrangement, they have taken the initiative and thankfully are now being funded more effectively. Britain in contrast are not prepared. They have had since the June 2016 referendum result to engage with what is a clear and well laid out road-map for disengaging from the EU, and yet they appear to be refusing to properly engage in the process. Rather than fully engage they believe they can have a bilateral negotiation with the European Union across three key areas before they need to engage in the rest of Article 50. The rights of EU citizens working in Britain and the rights of British citizens living in other parts of the Union in relation to accessing EU services such as healthcare, education and legal. The cost of exiting. Much of the British press has reported that Britain is being made to pay to leave the EU. However, the European Union budget is a 7-year budget which was completed in 2012 and will run to 2019. There are provisions in that budget which would be of benefit to Britain in relation to agriculture and research among a number of other areas. With the exit of Britain from the EU these monetary benefits are of course removed and as a result these complicated issues need to be sorted out. Britain has been too slow in moving on this element, only recently recognising that they do have an obligation but haven’t come close to estimating the cost of it. The third issue is in relation to the Irish / British border. The European Union stance on this issue is that it is the obligation of Britain to sort out the self-imposed challenge in relation to the border. The Irish Revenue Commissioners have done excellent work by looking at what the realities of a hard border might look like. Quinn believes that there will inevitably be a hard border and depending on the relationship Britain has with the rest of the Union post-Brexit, we just don’t know how destructive this border is going to be for our people and our trade. Quinn outlined that whatever the outcome it will certainly be less advantageous but the impact it will have and how it will affect different sectors simply no one knows. Quinn’s advice to businesses to minimise any possible negative impact of a hard border is to look at a strategy of establishing a Northern Irish footprint now and to do it with as minimal a cost as possible in case it is not needed. If the worst case scenario happens the queue to get into Northern Ireland post-Brexit will be extremely long. He cited as an example that the applications in the UK for Irish Passports, has increased from 6 to 60 a week. Quinn estimates that up to 90% of Irish businesses have not begun to look at the implications of what Brexit means to their business and stressed the need to begin that process now. If you would like to find out more information about preparing your business for the potential impact of Brexit contact a member of our consulting, tax or corporate finance team.